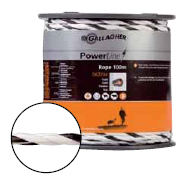 PowerLine Rope for semi permanent fences, suitable for horses and cattle. With 5 stainless steel wires for high conductivity. UV stabilised. Post spacing up to 8m. Braided TurboLine Cord prevents a lot of stretching and ensures a long life. By using 3 mixed metal wires in combination with 8 stainless steel wires an optimal conductivity is realised. 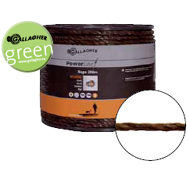 Soft-touch cord and a low breaking strength of 225kg provide high safety for your animals.